If These Parts Break Or Need Adjustment Give Our Team a Call! Broken spring repair is a demanding task that requires a lot of experience and skill. Since these components are vital parts of any garage door system, they must only be replaced by well-trained specialists, as otherwise, other parts of the door could get damaged. Not to mention, you yourself could get hurt. Springs are under a lot of tension, and when they break they can whip around and cause severe lacerations to anyone standing nearby. For this reason, you should give our team a call whenever you suspect something is wrong with these important components. 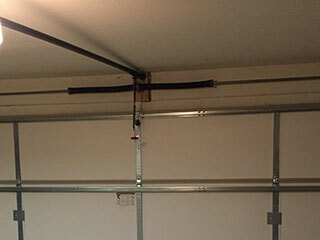 Every garage door uses one of two types of springs. Each of them works very differently and has slightly different requirements. Torsion springs are often preferred for heavier doors, although they can be a perfect fit for any door really, just as long as there is enough headroom space available above. Usually, a single unit is all that's required, as these components are very durable and flexible, and the fact that they use torque rather than contraction and extension in order to help your door rise makes them far less likely to go flying if they break. Torsion springs are mounted on an anchor bracket and keep their balance with the center support bracket. We can fix and replace their shaft, repair their winding cone and ensure that everything is properly secured to the cable drums. Extension springs work quite differently. They are the older of the two types, and also, as you've probably gathered by now, the more dangerous. A pair of them is usually installed, perpendicular to the door, one on each side. They work by stretching when the panels lower and contracting in order to raise them back up when the door needs to open. Because of their associated risks, they are often interwoven with safety cables that are meant to keep them in place in case they break. If your overhead door springs need some adjustment or to be replaced, you can count on our technicians. Call Garage Door Repair Spring today and we'll take care of whatever you need us to.